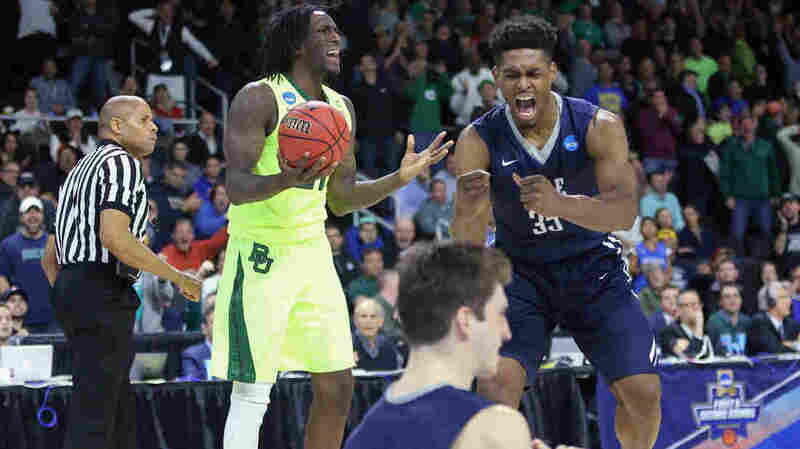 Yale Notches Historic Upset Win Over Baylor, Sparking A Great Soundbite : The Two-Way After notching its first-ever win at the Big Dance, Yale will face Duke in the second round. At the post-game news conference, a question about rebounding created a memorable moment. Taurean Prince (left) of the Baylor Bears explained rebounding after his team lost to Brandon Sherrod (right) of the Yale Bulldogs Thursday night, in the first round of the 2016 NCAA Men's Basketball Tournament. Extending a long-awaited trip to the NCAA men's basketball tournament, No. 12 seed Yale upset fifth-seed Baylor in the West region Thursday night. Yale notched its first-ever win at the Big Dance, 79-75, relying on strong defense and rebounding. The historic win comes at the Yale Bulldogs' first trip to the NCAAs since 1962, as Yale's student newspaper reports. The paper adds, "The Ivy League's automatic NCAA Tournament bid has now resulted in five wins over the past seven tournaments." Yale moves on to face Duke in the second round — but at the post-game news conference Thursday night, one reporter's question about rebounding created a memorable moment, as Baylor star Taurean Prince delivered an answer that's being praised for exemplifying both straightforward simplicity and deadpan sarcasm. "Um, you go up and grab the ball off the rim when it comes off. And then you grab it with two hands, and you come down with it, and that's considered a rebound. So, they got more of those than we did." We'll note that Prince, who scored 28 points in the game, did not mention the time-honored practice of using one's body to establish position around the basket — the "boxing out" of one's opponents, as he might have said. Yale outrebounded Baylor, 35-30. Yale's Bulldogs weren't the only No. 12 seed to score an upset Thursday: The University of Arkansas Little Rock Trojans erased an imposing Purdue lead in the second half to shock the Boilermakers in double overtime, 85-83. That win brought its own historic citations. As the Arkansas Democrat Gazette reports, it is UALR's "second NCAA Tournament victory and first in 30 years. It came after being down 14 points with four minutes left and by four points with 33 seconds left." The Trojans will now prepare to play the Iowa State Cyclones on Saturday. For Yale, Thursday's win brought welcome relief from the off-court controversy surrounding former captain Jack Montague, who attended the game — and who's planning a lawsuit against the university over his expulsion that came after sexual assault allegations were made against him. Yale's win wasn't as welcome for many basketball fans who filled out tournament brackets. After the game, CBS Sports said that fewer than 6 percent of brackets filed with the network remain perfect. With March Madness now in full swing, millions of Americans will spend this weekend ignoring weather reports, tax deadlines and the U.S. election season to focus on college basketball. The NCAA lists the schedules for the men's and women's tournaments.